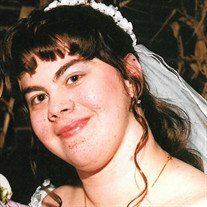 Rebekah “Becky” Susanne Owens of Mullica Hill, NJ, died on Tuesday, November 27, 2018. She was 41. Born on August 9, 1977 in Buffalo, NY, she was the daughter of the John and Janice Downey Walters of Akron, NY. She graduated from Akron Central High School and earned a Music Therapy Degree from Nazareth College. Becky worked most of her life in nursing homes as an activity assistant. She went back to school to become and EMT in 2010 and worked at GEM Ambulance Service until her passing. Becky loved helping people who were in need of help. She loved music of any kind and could play a wide variety of instruments. Becky grew up playing the Tenor Sax in Akron town band and often gathered at the park gazebo in the center of town to perform in concerts alongside of her entire family of musicians. She lived for it! Becky and her husband, Clifton met on the internet, via AOL in 1999 and married on October 21, 2000 in Akron. After their wedding, they took a five day cruise to the Bahamas and Key West. Since then, they resided in Mullica Hill, NJ. She enjoyed putting puzzles together and framing them, arts and crafts and spending time with her fur babies, Tater-Tot, Lacie and Roxie, three Miniature Pinschers. Becky was a member of the Calvary Hill Pentecostal Church in Glassboro, NJ, and a brief member and EMT of Ferrell Fire CO. #1 in Elk Township, NJ. Those who had the privilege of working with her at GEM Ambulance Service, absolutely loved and adored her. She had a heart of gold. In addition to her husband, Cliff, she is survived by a sister, Rachel Fisher of Batavia, NY; a brother Joseph of Rush, NY; a baby brother Jonathan of Kannapolis, NC; and numerous nieces and nephews that she loved, adored and enjoyed visiting. A visitation will be held on Sunday, December 2, 2018 from 4:00 pm -6:00 pm, at Fellows, Helfenbein & Newman Funeral Home, Chestertown, MD, where a Time of Sharing Remembrances will begin at 6:00 pm. The local Visitation will be held at The First Baptist Church of Akron, 122 Main St. on Thursday; December 6th from 4:00 p.m. to 6:30 p.m., where the Funeral Service will be held Friday; December 7th at 10:30 a.m. Burial will follow at Pioneer Cemetery.